This contemporary space is brightened up by the ultra-reflective Ultra Craft cabinetry in a high gloss back South Beach door style set off by the bright white counters and stainless steel appliances. 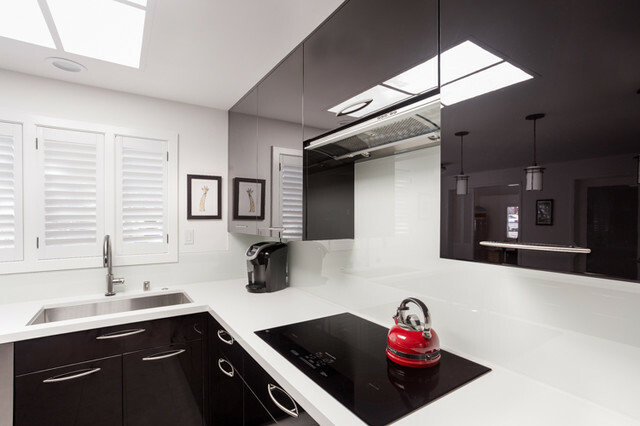 The kitchen backsplash is in an ultra-clear white glass sheet tile. Cabinetry accessories include a “Pull-Side-Pull” unit, two tray dividers in base cabinets, tall pull out spice inserts, metal roll-outs, utensil divider, trash/recycle bin on the peninsula, a knife block, two double tier cutlery dividers, one single trash can under sink and a lift-up mixer shelf. Stainless Steel under mount sinks by Nantucket Sinks with contemporary stainless faucets. Stylish matching Dog Kennel in the same high-gloss midnight black Ultra Craft cabinetry in the South Beach door style. The laundry room features cabinetry by Bauformat of Germany in a contrasting high gloss white laminate. Photography by City View Photography.